Shortly after our first wedding anniversary we did what every couple tends to do and decided to try for baby. After a long 14 months of having no success we were mentally exhausted and turned to an Infertility Specialist. We learned that I have what's called Diminished Ovarian Reserve (a known side-effect of the serious acne medication, Accutane). They explained that natural conception would be unlikely and our risk of multiple miscarriages was high. We were crushed. Through all of our prayers, our hearts led us to Adoption. We met with an attorney a month later and thus began the lengthy process. After a short wait we received the call that we were chosen by an expecting couple. We were beyond elated to be chosen. We met with the couple and they told us we would become parents to a little girl in just a few short months. To say we were excited would be an understatement. A few weeks later, our birthmother showed signs of preterm labor. And our daughter was delivered by emergency c-section at 31 weeks gestation. 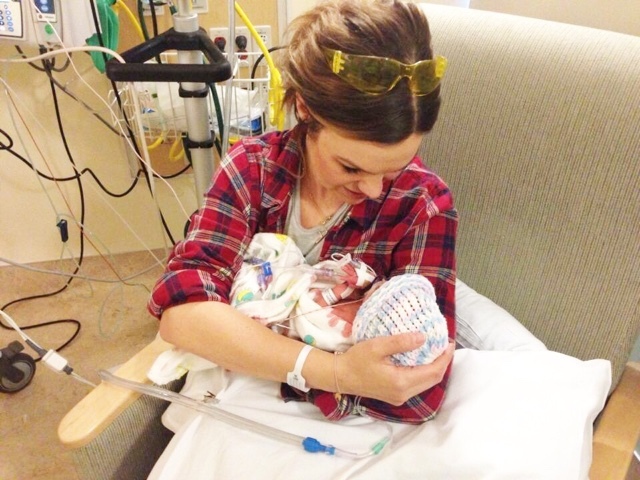 She spent her first few hours of life fighting, alone in a NICU room hooked up to a ventilator. 3 pounds of pure heaven. I'll never forget the first time I laid my eyes on her, I was so scared and so in love, I just wanted to climb in her little incubator and tell her, "I'll always protect you and I promise to give you the world." And just like that all the pain of infertility was quickly forgotten. We chose the name Finley, which means "fair warrior." Couldn't be more fitting. We learned that she had suffered Bilateral Grade-3 Brain Bleeds due to her prematurity. When we googled "Brain Bleeding" we saw that likely she would have Cerebral Palsy (CP). We were told she would be very delayed and might not ever walk. We chose to do everything in our power to make sure this wasn't the case. Early intervention is Key. 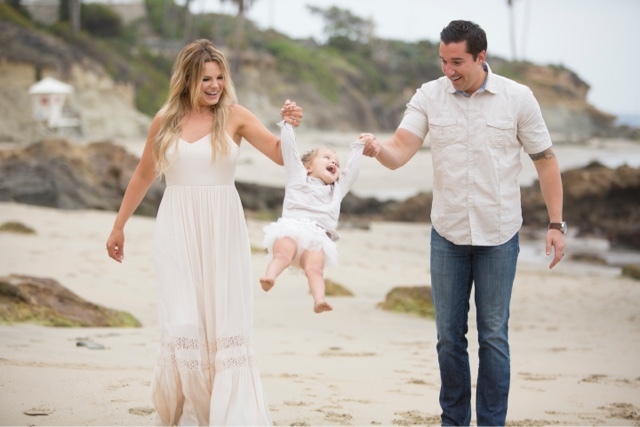 We started therapy and Infant Stimulation when she was just 3 months old. We have done tri-weekly Occupational and Physical therapies, stretching programs, eye-surgery and patching, Botox injections, some medications, restricted diets, essential oils, supplements, infant massage, day bracing, night bracing, horse therapy, water therapy, kinesio-taping, and ballet. All while trying to let her just enjoy being a kid. Finley's official diagnosis is Spastic Diplegia Cerebral Palsy with overall Left-Side Weakness. Spastic diplegia, historically known as Little's Disease, is a form of CP that is a chronic neuromuscular condition of hypertonia and spasticity — manifested as an especially high and constant "tightness" or "stiffness" — in the muscles of the lower extremities of the human body, usually those of the legs, hips and pelvis. 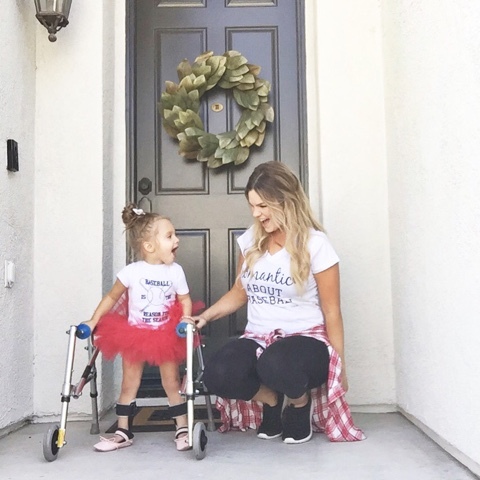 Spastic diplegia accounts for about 22% of all diagnoses of cerebral palsy, and together with spastic quadriplegia and spastic triplegia make up the broad classification spastic cerebral palsy, which accounts for 70% of all cerebral palsy diagnoses. A few weeks ago, Finley was fitted for a wheel chair. It was the sweetest little chair I've ever seen. However, it was a tough pill to swallow that this new piece of equipment would be the next season of our life. We are not complaining, we know we are so blessed, but like every parent we long for endless opportunities for our girl. She wants to be standing all the time, I know this because she tells me so. My heart breaks a little everytime she asks me to help her stand. If I could give her my legs, I would. As a parent there is nothing more devastating then watching your child suffer or struggle. She has to ask me to walk, to sit on something, to get off something, and often in the mornings she struggles to sit herself up. A few months ago, the magic happened. We had many many signs leading us to this SDR surgery that is done in St. Louis. It is known as a life changing surgery for kids with Spastic CP. I've even seen it referred to as "the cure" for this type of CP. Another girl said after the surgery it was like she had new legs, a lot of people are saying that actually. Her Pain Management Specialist told us at our last visit in Febraury that he thinks Finley would be an excellent candidate for this procedure. Really? An opportunity for new legs for Finley?! Her Spasticity is already high and can become tighter as she grows. Often people experience joints popping out of place due to their spasticity, as well as spasms and severe muscle aches, which are all extremely painful. There are medications, but a lifetime of strong painmeds and muscle relaxers filtering through her little liver isn't what we want for her. This surgery is a permanent spasticity reducer and is best performed at the young age of 3. We've been through the application process and just received our surgery date in November! 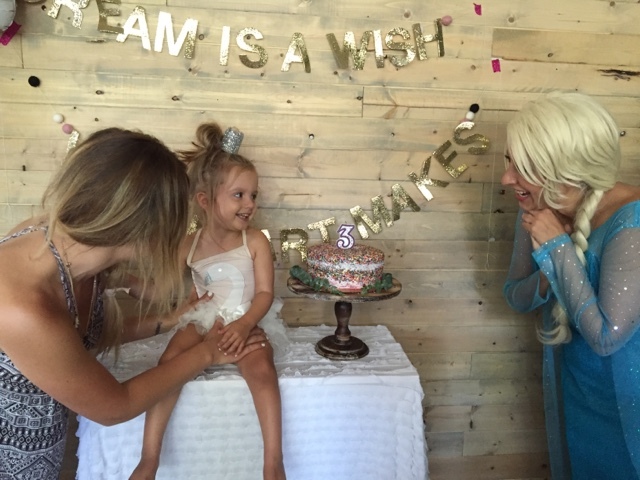 We know this is the next chapter of her young life. This surgery costs $50k and traditionally insurance does not cover it. We will have to travel accross country and stay in a hotel nearby. There is greater risk of "blood clots" if you choose to fly too soon after surgery, so we are hoping to raise enough to afford renting an RV so we can keep her comfortable during the 25 hour drive. That and we will be missing work, my husband and I are both commission only so being gone almost half of a month is a very scary thing for us, it would be incredible to not have to add financial stress. My girlfriend, Brittany, came up with the idea to fundraise using a Dare to Dance Challenge Campaign. (Think ALS ice bucket challenge.) We hit the ground running with it, and so far it's been so successful! It led us to raise $45k in two weeks! We've seen amazing videos, even some from the Kings, Lakers, Perez Hilton, the KTLA news crew, and the famous twins from ABC's Tje Bachelor. We have had to pinch ourselves quite often the last few weeks that everyone is dancing for our girl! 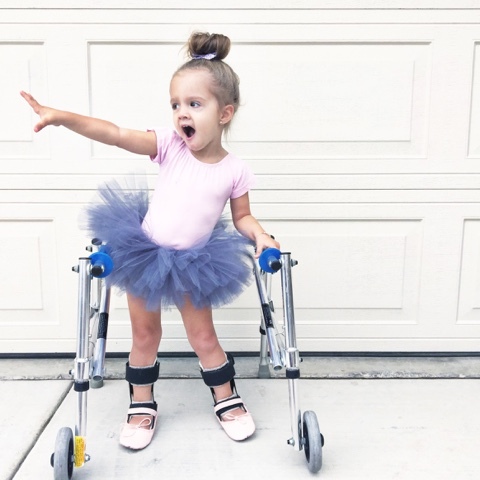 We long to see our daughter take her first independent steps and cannot wait to dance with her and watch her twirl around in that adorable Trevi Ave Co tutu!